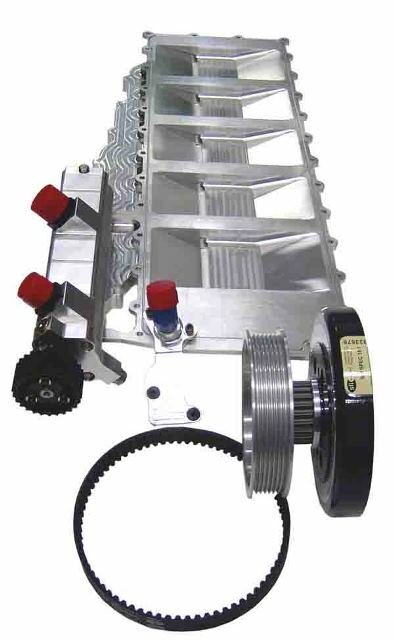 Dry Sump system Gen II for the Dodge Viper engine. This kit was an evolution of our GTSR racing system for the gen II to maintain the factory air conditioning in a production Viper. As proven with the standing mile world record, it functions very well in full racing conditions as well. Our new rear mounted fuel pump option for the small pump is now available. Shown below for the Gen II is a 7 stage dry sump oil pump with a turbo scavenge section and the new rear fuel pump mounting pad.